Automating adding trusted passwords or certificates into your users keychains? Well this new prompt (as of macOS 10.12) can confuse users and subconsciously train them to hit "Always Allow" every chance they get. Not ideal, so let's discuss how to reduce these. set-generic-password-partition-list Set the partition list of a generic password item. set-internet-password-partition-list Set the partition list of a internet password item. set-key-partition-list Set the partition list of a key. Partition lists are essentially access control lists. If an application (or suite of applications) is not in the partition list, you will receive the above prompt when the application accesses the keychain item. Isn't this already covered when using the -T flag? I'm afraid not my friend, although the -T flag is still needed in most cases. The meat of the command is in the -S flag where you state the list of applications accessing the keychain entry. In this case teamid:UBF8T346G9 refers to ALL Microsoft Office 2016 applications. I'll show you where to get these in a bit. So...how do I go about finding these application references? keep in mind that it takes at least a couple minutes for the full output to load into less. You want to take note of the access entry 3. Description sub item will state all the partition IDs allowed to access the keychain entry. The time consuming task here is to dump the keychain access list (-a) before and after hitting "Always Allow" to the GUI prompt above and noting the difference. To get you started I have a couple partition IDs already gathered here. As you'll see in the security man page, besides the -S flag, the -k flag is also required and must state the user password. Next you must choose one or more methods on how you're going to find or "match" the keychain entry. Choose your own adventure here, but it's probably easiest to match generic password entries based on the service name (-s), and certificate keys based on the key name (-l). To Note: in 10.12.5 there is a bug when matching on the service (-s) flag when using the set-internet-password-partition list. The flags is essentially ignored and the command will currently change partition-lists for ALL http/https entries. Depending on your security requirements you could add http/https partition ids to all http/https entries, but note you may not want to modify internet password partition lists at this time. I do have a bug report submitted to Apple enterprise support, but please do submit additional reports if this is important to you. Happy Hunting, and I hope this both improves user experience and security by training your users to not get into the habit of hitting "Always Allow" to every prompt they see! Please reply in the Comments for any additions to this list! Unless AnyConnect is aware of which certificate it needs, it's going to go gangbusters through your system keychain looking for it while prompting for local administrative rights at every useable certificate. 2) Stage an ~/.anyconnect file. You might want to stage this anyway to autofill the server address, but here you can inform AnyConnect of the correct certificate to use. I'm assuming that the vpn certificate is installed in the user keychain. Import your certificate allowing trust settings for the AnyConnect application. 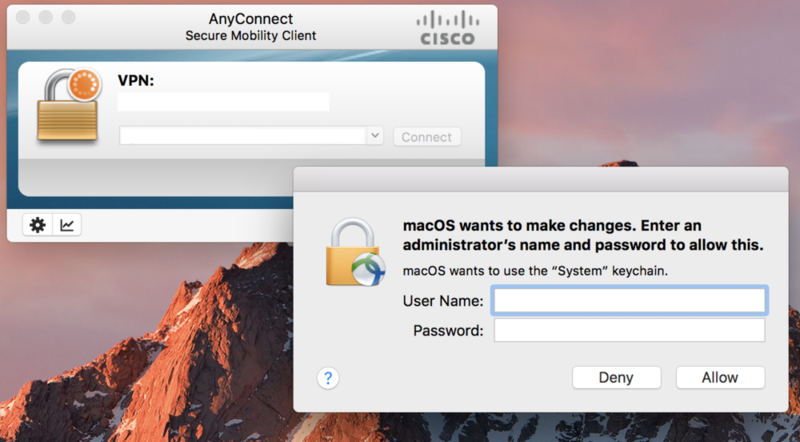 In addition you may want to modify the partition IDs to hide the "Allow/Deny" prompt in macOS Sierra (I'll expand on this in another blog post).